At first glance, it looks like a fiery monster out of “The Incredibles.” Or maybe a glowing alien orb, or a giant, irritated zit popping up above the Earth’s surface. But it’s neither. Rather, it’s an incredibly rare, 65-foot-tall (20 meters) lava-dome fountain. Normally, volcanoes erupt lava in powerful jets that look like fountains gone wild. 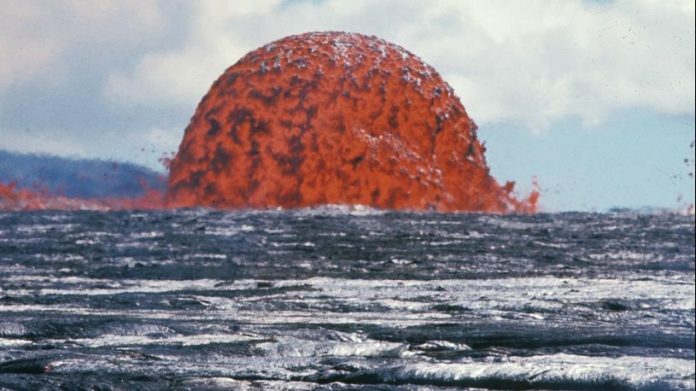 But in this photo — captured Oct. 11, 1969, in Hawaii — the lava spurted out symmetrically, forming an aesthetically pleasing lava-dome fountain. The U.S. Geological Survey (USGS) tweeted the photo on March 29 for Throwback Thursday (#TBT), a popular hashtag used when people post nostalgic photos from their past on social media. The red-hot lava fountain certainly is a nostalgic moment for the USGS. This particular fountain was part of the Mauna Ulu eruption, which lasted (on and off) for an astonishing five years, from May 1969 until July 1974, according to the USGS. Mauna Ulu is a volcanic cone on the east rift zone of the Kilauea volcanoon the Big Island of Hawaii. At the time Mauna Ulu erupted, it was the longest-lasting and most voluminous eruption on Kilauea’s eastern side in at least 2,200 years, the USGS said. The 1,774-day eruption spewed out about 460 million cubic yards (350 million cubic meters) of lava — enough to fill 140,000 Olympic-size swimming pools. Mauna Ulu no longer holds the record for the longest-erupting volcano. Pu’u ‘Ō’ō, a volcanic vent on Kilauea’s east rift zone, has erupted nearly continuously since January 1983, according to a 2003 report from the USGS. But despite Pu’u ‘Ō’ō’s feat, “the Mauna Ulu eruption was more accessible to the public, with a viewing platform established at one point to observe a lava lake in the crater,” the USGS said. Typically, lava fountains occur when gas bubbles rapidly form and expand in molten rock, which prompts jets of lava to spray outward, the USGS said. Though impressive, Mauna Ulu’s fountain wasn’t on the big side; lava fountains range from about 30 to 330 feet (10 to 100 m) in height, and some have reached the incredible height of 1,640 feet (500 m), the USGS reported. Geologists have found that lava fountains can gush out of isolated vents and fissures, from active lava lakes and from lava tubes that are exposed to water.